Grande Estate Auctions in conjunction with “The Mad Picker” Wayne Learie, are presenting the largest auction they have ever assembled of oil and gas collectibles, as well as soda and advertising signage and memorabilia. Over 750 lots are up for grabs all day on the auction block. The auction kicks off at 11AM Pacific Time on January 1st, 2018. Registrations and pre bidding are now available to get in on the action early. 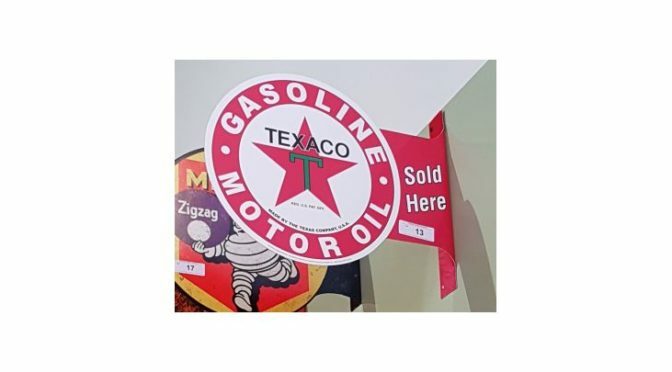 The auction is fully loaded with gas pumps, pop coolers, oil racks, oil cans and SIGNS, SIGNS, SIGNS; with some of the most interesting man cave finds of the year. Lots 14, 15, and 16 present a highlight of Shell signs ready for display. Lot 14 is a double sided tin flange sign saying “Fill Up here, Friendly Service”. Next up is a Shell SST Sign at Lot 15. Third is a fantastic vintage Shell Motor Oil porcelain reproduction sign. All three lots open for $10 and hammer down to the highest bidder. There are literally dozens of Coca Cola collectibles and signage. Standouts are Lot 22 which is an SST sign with a delivery person with a crate of bottles, and Lot 37 which offers a pair of vintage signs for one hammer price. Items are still being photo graphed and added to the auction each day. Bidders can brows the online catalog from any device to keep up to date on what is coming down the pipeline. The auction all begins for live bidding at 11AM Local Time on January 1st, 2018, presented by Grande Estate Auctions. They will present a live audio feed to give the worldwide audience of bidders a great part in the auction day. Absentee bidding is currently available and registrations are open. The auctioneer will be happy to answer any questions about the online catalog via telephone or email.